James (Jim) O.F. 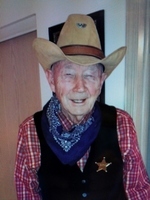 Durham, age 92 of Brentwood, Tennessee passed away on March 15, 2019. Mr. Durham was born in Hendersonville, Tennessee to the late Elma Hale and William R.
Jim was never a sheriff, he portrays one at his assisted living home in a costume contest and he won. He was a great and understanding father. Preceded in death by his wife, Mary Allen (Purn) Hutchison Durham; brother, Carl Durham and Earl Durham and sister, Junie Lee Scott. Survived by: son, James Derrick “Rick” (Kristin) Durham of Brentwood, TN; daughter, Denise (James) Morrisey; grandchildren, Matthew Morrissey, Jordon Morrissey and Myles Fox Morrissey all of Franklin, TN; brother, Donald (Anita) Durham of Goodlettsville, TN; sisters, Mary Jean Dorris of White House, TN, Virginia(Kenneth) Plumlee of Lakeland, FL and Jerald Ann (Bruce) Johnson of Franklin, TN and several nieces and nephews.